The Bauls are mystic minstrels living in rural Bangladesh and West Bengal, India. The Baul movement, at its peak in the nineteenth and early twentieth centuries, has now regained popularity among the rural population of Bangladesh. 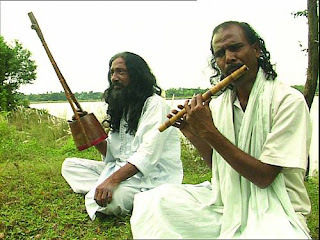 Their music and way of life have influenced a large segment of Bengali culture, and particularly the compositions of Nobel Prize laureate Rabindranath Tagore. Bauls live either near a village or travel from place to place and earn their living from singing to the accompaniment of the ektara, the lute dotara, a simple one-stringed instrument, and a drum called dubki. Bauls belong to an unorthodox devotional tradition, influenced by Hinduism, Buddhism, Bengali, Vasinavism and Sufi Islam, yet distinctly different from them. Bauls neither identify with any organized religion nor with the caste system, special deities, temples or sacred places. Their emphasis lies on the importance of a person’s physical body as the place where God resides. Bauls are admired for this freedom from convention as well as their music and poetry. Baul poetry, music, song and dance are devoted to finding humankind’s relationship to God, and to achieving spiritual liberation. Their devotional songs can be traced back to the fifteenth century when they first appeared in Bengali literature. Baul music represents a particular type of folk song, carrying influences of Hindu bhakti movements as well as the shuphi, a form of Sufi song. Songs are also used by the spiritual leader to instruct disciples in Baul philosophy, and are transmitted orally. The language of the songs is continuously modernized thus endowing it with contemporary relevance. The preservation of the Baul songs and the general context in which they are performed depend mainly on the social and economic situation of their practitioners, the Bauls, who have always been a relatively marginalized group. Moreover, their situation has worsened in recent decades due to the general impoverishment of rural Bangladesh.